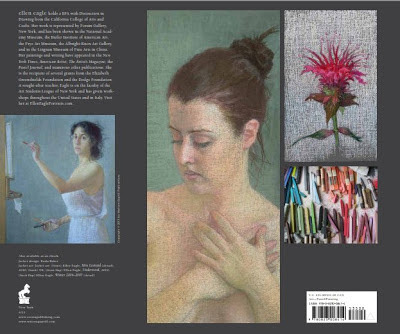 Bio: British artist Angela A’Court trained at West Surrey College of Art and Design, Parsons School of Art and Design, New York and Goldsmiths' College, University of London, whence she emerged with a BA (Hons) Fine Art Textiles. After graduation from Goldsmiths' College she worked as an interior designer in an architectural practice in London before choosing to work independently. 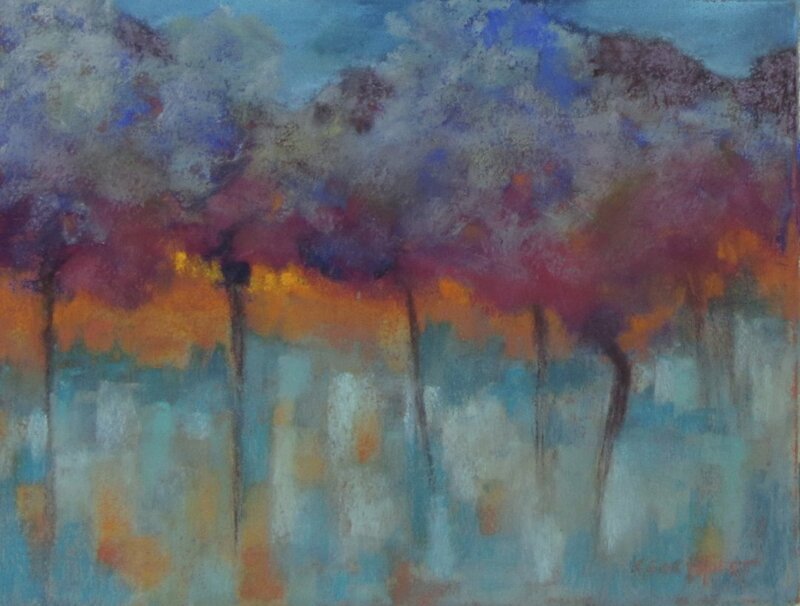 After fifteen years as a designer, she returned to painting full time, in 2002. 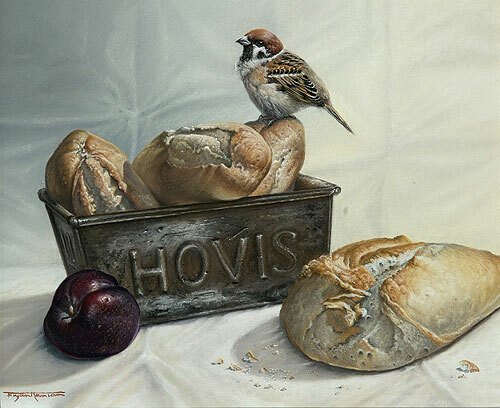 Since then, she has regularly exhibited her pastels in the UK at the Stour Gallery, the Pastel Society, the Discerning Eye, Highgate Contemporary Art London, Thompsons Gallery London and Aldeburgh Josie Eastwood Gallery. 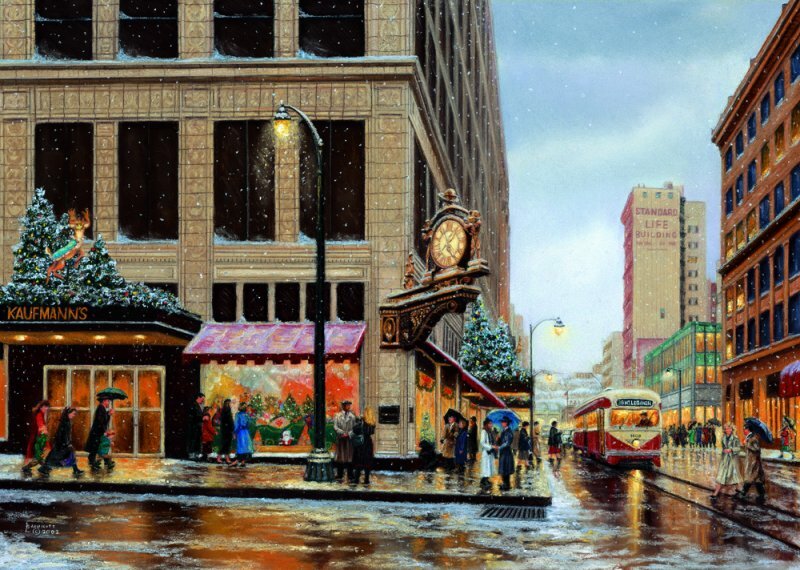 In 2003 she moved to New York where she now lives and paints. Major influences evident in her work include Matisse and Hockney. Angela was Artist in residence at the Stephen Gaynor School NYC in 2011 – 2012 and conducted a workshop at Unison Pastels, Northumberland in 2012. Her work in is many private collections, including that of Christopher and Lori Rothko NYC. 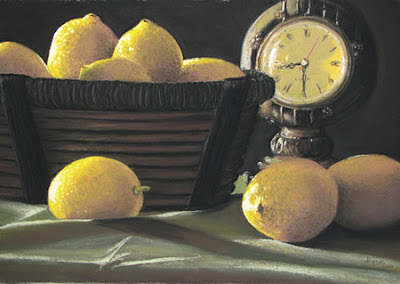 Medium: Pastel. Angela states that she wants to promote pastels as a modern medium. Subjects: Positive and negative space, as expressed in figures, interiors and still life pieces. Navigation: A'Court's design skills are apparent in this clean, easily navigable website. 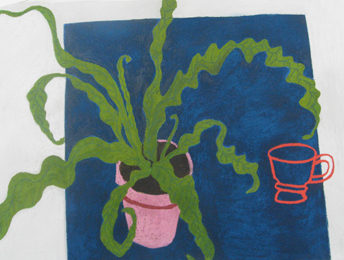 Gallery: Prints; Figures; Chairs and tables; Still life with flowers; Objects. Image View: Thumbnails open in a scrollable viewer and may be downloaded. Information of medium and dimension is supplied. Pink pot, red cup is 47 x 62 cm, 344 x 260, 95 KB. Bakhoum studied in Paris at l’Atelier Met de Penninghen, a private school of design, d'art graphic art and interior design, under the auspices of l’Ecole Estienne, the Graduate School of the Arts and Printing Industry. Though the experience gave her the base she needed to become an artist, Bakhoum pursued her studies by experimenting with multiple media. For more than a decade, Bakhoum has held an annual exhibit at the Safarkhan Gallery in Zamalek. She has had annual solo shows in Galerie Claudine Legrand, 49 rue de Seine, Paris, since 1996; and in Galerie Safar Khan, Cairo since 1999. Though she lives in Paris, displaying her work in Egypt is a way to stay connected with her past and promote the work of Egyptian artists. Her current exhibit is especially evocative of her roots, as many of the images are inspired by Oriental ideas. Style: See for yourself. I have posted two paintings the better to illustrate her techniques. One has a marble dust background, the other collage. 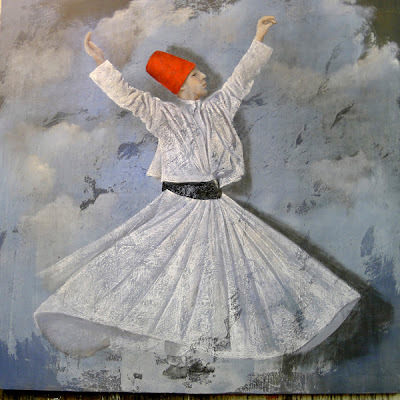 Techniques: Bakhoum often paints on canvases that have been prepared with various materials. She generally makes use of rough cloth or sanded ground on which the pastel can hang, then covers them with a palette knife a bit like a plasterer. Thus, accidents are created. When she paints characters, she loads the canvas using collage, stamps or materials such as marble powder that thicken the canvas and interact with the pastel. While the material is wet, she then incorporates pigments then wipes the surface to obtain a distressed, old effect. If you look closely, you’ll notice all of her colours have a distinctive shimmer. This is created by mixing the paint with ground marble. 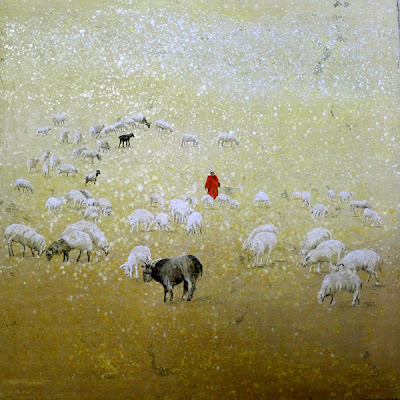 This is evident in Les Moutons 130x130 cm. Navigation: Website is in French but clearly laid out. Image View: Thumbnails provide information on mouseover. Clicking on them provides an enlarged image, in a viewer that can be scrolled, but occasionally on a separate page. Images can be downloaded. Le derviche dans le ciel (2011) is 120x120 cm, 600 x 600, 319 KB. 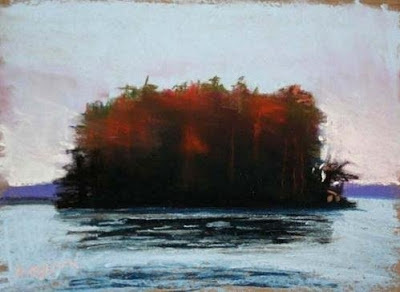 Bio: Jim Morgan is a North Carolina-based artist originally from New Jersey. Jim attended The Pratt Institute, New York, where he studied art and design. During those years he was influenced by artists like Milton Avery, Wolf Kahn, Mark Rothko and Franz Kline. After college he moved back to New Jersey and began sketching and photographing some landscapes with the intention of producing some oil paintings. He picked up some pastels to do some color studies and the rest is history. He never did start the oil paintings. 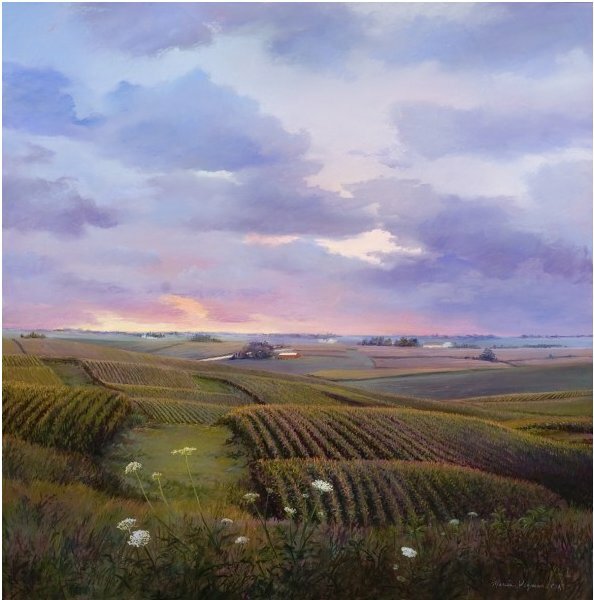 Jim’s paintings are represented in many private collections, and also in AIG, New York, Princeton Theological Seminary, and Columbia University, New York. Style: Expressionist, semi-abstract, to calligraphic. The botanicals seem to lie somewhere between stained glass and Japanese calligraphy, with a nod toward fractal geometry. The landscapes are deceptively simple – note that Morgan’s cites among his influences Mark Rothko, Franz Kline, Milton Avery and Wolf Kahn. Also Terry Winters, Georges Seurat (particularly his charcoal drawings), and Degas. Navigation: Simple, streamlined, uncluttered. The main menu always available..
Gallery: The Landscapes; The Botanicals; The Others. 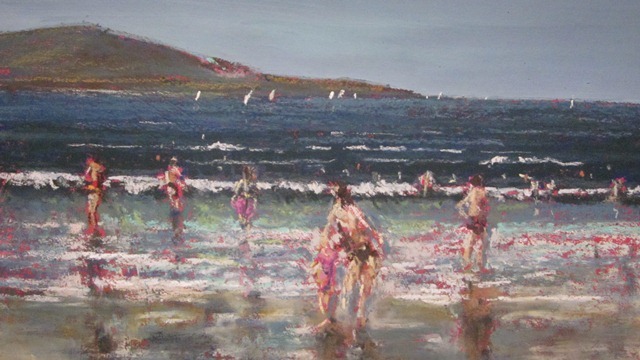 Bio: Irishman Aidan Butler is a self taught artist who decided to paint professionally in 2001 after a successful solo exhibition in the Bank of Ireland’s art centre and a commission from the Mid-Western Health Board. Up to then he had painted intermittently, designing threatre posters and doing the occasional commission in the 1980s and 1990s. Since 2001 Aidan has had several solo shows and numerous group exhibitions. He was selected to represent Ireland at the Florence Biennale of Contemporary Art in Italy in December 2005, and also exhibited with other Irish artists in Hangzhou, China in June 2005. 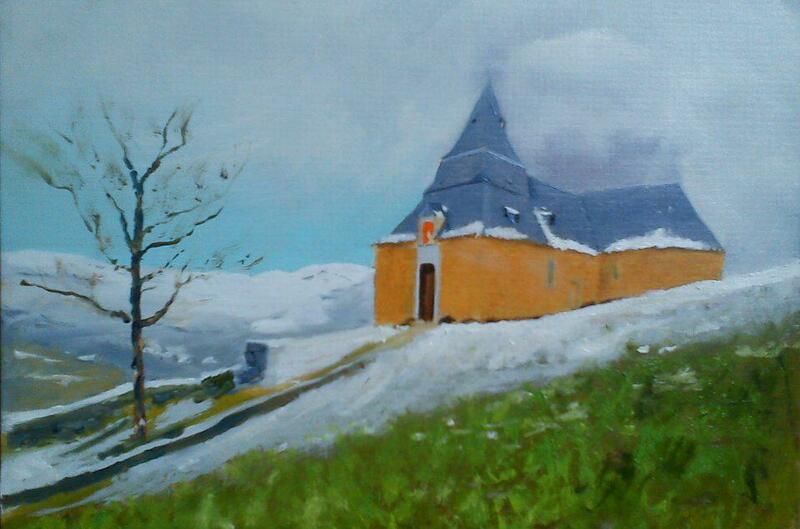 From 2007 he has been regularly accepted into the Royal Ulster Academy annual shows in Belfast. 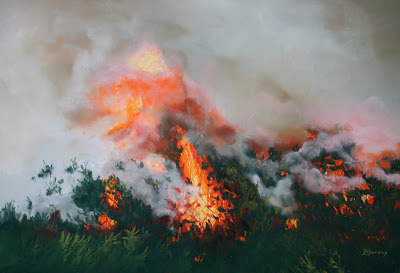 He participated in a group show at the Wexford Opera Festival Exhibition in 2012. 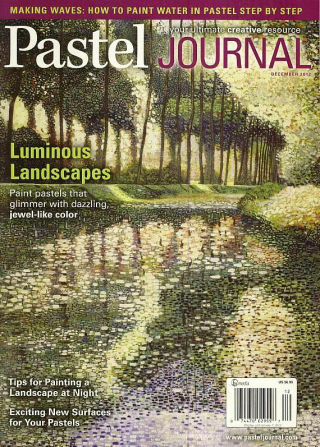 Style: Impressionistic bordering on abstract, except for the acrylics, where a more graphic approach is adopted. Navigation: Nice site layout, easy and logical to follow. All menus remain accessible at all times. 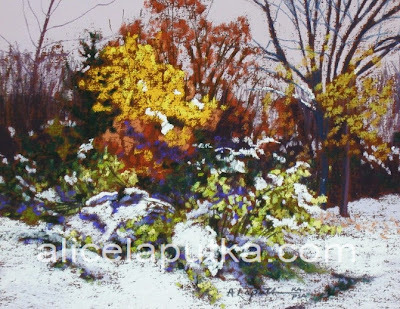 Gallery: 2012 (current paintings, all media); Prints; Archive – Pastel; Oil; Acrylic. Image View: Thumbnails open in a viewer on a new page. Information on dimension is not always provided. Download is possible. Regatta Watchers is 640 x 360, 87 KB. Bio: Aurelio Rodriquez López was born in 1958 in Génave, Jaén, Andalucia, and moved to Madrid to train as an engineer in 1976; after a year he quit university to become an artist. Like many another Spanish artist he took to painting street portraits, first in Madrid (where in 1978 he took lessons in Soto Mesa School of Art), then Marbella in the summer of 1983, and Tenerife in 1991, where he studied sculpture with Guillermo Batista Diáz. He received a commission from the royal court of Bahrain in 1996. He has since painted some of the major players of the world, from the kings of Morocco, Hassan II and Mohammed VI, the late King Fahd of Saudi Arabia, Tamara and Petra, daughters of Formula 1 boss Bernie Ecclestone, and members of the rock band Def Leppard, among others. Rodriguez has taken several courses in etchings, aquatint, linocut and photogravure, besides learning lithography from José Montañes Garnica, Spanish Museum of Contemporary Etchings, Marbella. His picture Crisis? 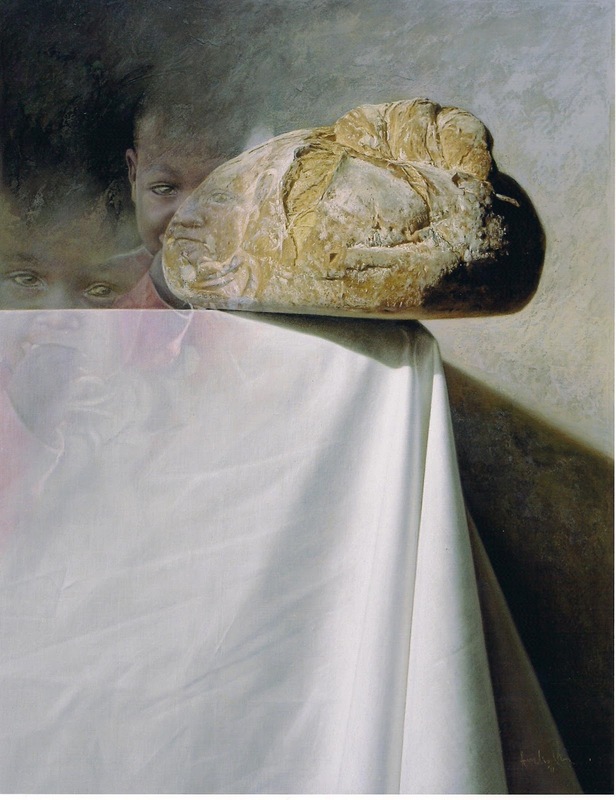 showing two children looking at a loaf of bread won first prize at the First International Pastel Biennial in Spain, 2011. Rodriguez had his first solo exhibition in 1979 and a retrospective in 1995, with numerous shows in between. Rodriguez has shown his work in Madrid, León, Marbella, Valencia, Malaga, Granada, Düsseldorf, Munich, Miami, New York, and London. Aurelio Rodriguez López lives in Puerto Banús, Marbella. Medium: Pastel; oil; watercolour; pastels are painted on acrylic plaster. Navigation: This website is available in Spanish, French, and English. I have confined my remarks to the English version. I don’t see any evidence that the site has been updated in recent years. 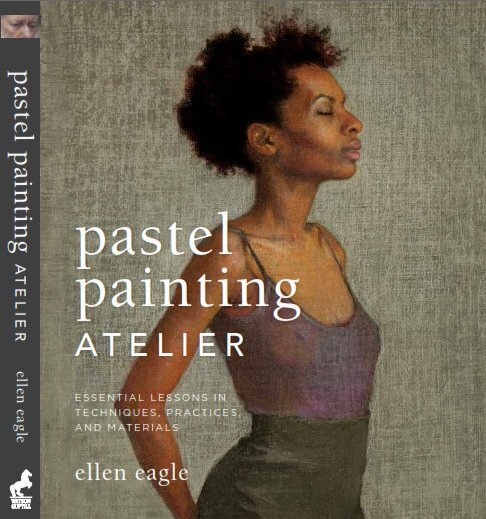 Gallery: To see all the pastels grouped together go to Techniques – Pastel; and to Portraits – Pastel. There is much more to be viewed in the other gallery pages under different techniques and media. Image View: Thumbnails open in a viewer on same page. Information on medium and size is provided. Download is possible, although most if not all the images are splashed with a copyright watermark. Bio: Born in Belfast, Northern Ireland, Rosie McClelland is an honours graduate of Manchester Polytechnic, Faculty of Art and Design (1973) and studied Fashion Illustration at St Martin's School of Art, London from 1973 to 1974, when she was employed as designer by London Fashion Houses up to 1981. During this period, Rosie lectured part-time in Design and Illustration in Birmingham Polytechnic, Hastings College of Further Education, Inner London Education Authority and the Paris School of Fashion, London. While teaching art privately from own studio. In 1997 she became a member of Berufsverband Bildender Kunstler, (BBK) – a network of professional artists in Germany. Rosie returned to Northern Ireland 1999 where she has remained to date, taking on part-time lecturing in Armagh College of Further and Higher Education, Newry and Kilkeel Institute of Further and Higher Education and private groups in Belfast. 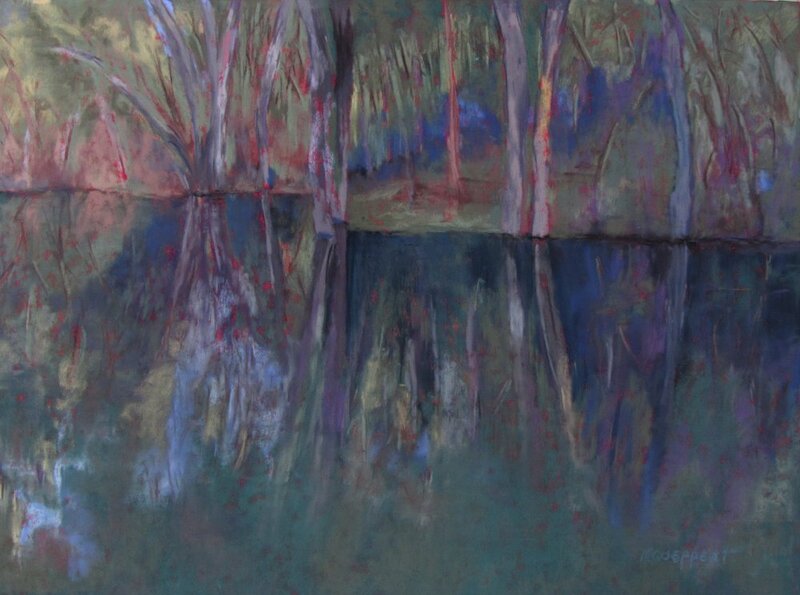 Rosie has been exhibiting and selling her art for the last 30 years all over the world. Her work can be found in public and private collections in Germany, France, UK and Ireland. Navigation: Main menu remains accessible at all times. Image View: Thumbnails enlarge in Flashviewer, but if you click on the image a download button appears. The enlarged image may be further enlarged, and may be saved. Information on medium and dimension is mostly withheld. Muckross Head is 1400 x 1339, 983 KB. Bio: Jane Meyler is originally from Dublin and now living in Rosslare, Co. Wexford. Having always loved art from an early age and throughout secondary school, it is only since 2009 that Jane has rekindled her love of painting. 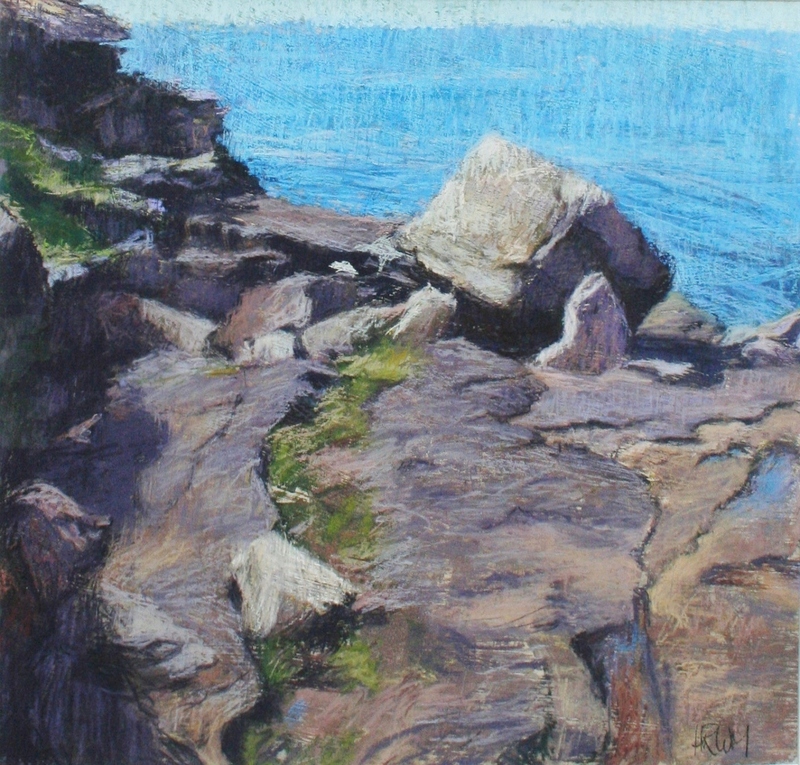 She has been involved in the Wexford Art In The Open Festival where she was introduced to pastels at a workshop by Greg Moore. 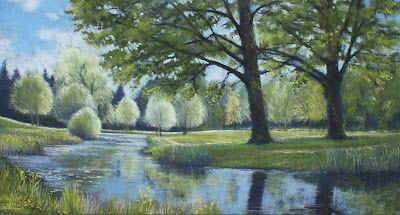 She became a full member of the Pastel Society ofIreland in January 2012. Jane is basically self taught and works from her studio overlooking Rosslare Bay where the sea, the beach and the high skies provide her with constant inspiration. A member of SEPA (South East Plein Air Painters), Jane exhibits regularly in Co. Wexford at the Rosslare Gallery, The Denis Collins Gallery, Wexford Picture Framing, and Greenacres and in Dublin at The Apollo Gallery, Dawson Street, Dublin 2. 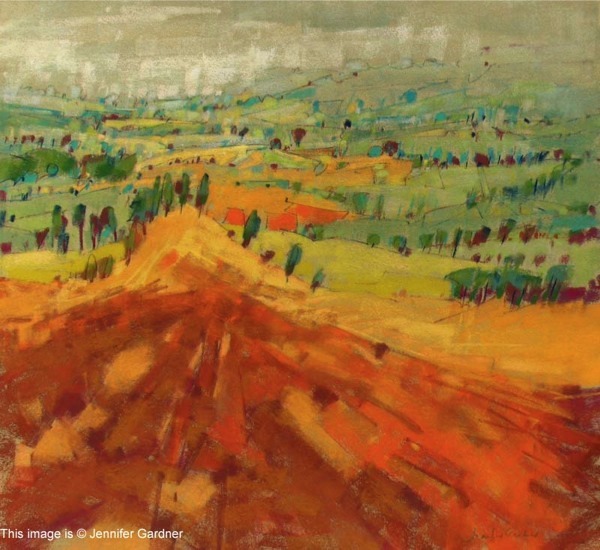 Jane has exhibited in selected group exhibitions including the Pastel Society Annual Exhibition 2011 in Newry, Belfast, Ross Fine Art Gallery in Letterkenny, Ardgillen Castle, and the Art in the Open Exhibitions 2009 - 2011. 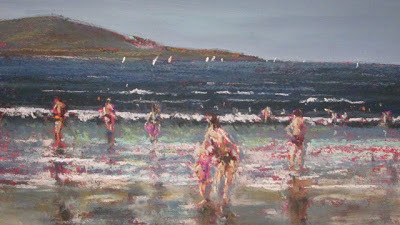 Her work is in collections throughout Ireland and in London, Scotland and the USA. Image View: Thumbnails enlarge in viewer, and give information on medium/dimension on mouseover. The enlarged image may be further enlarged, and may be saved. Resting, The Burrow, Rosslare is 550 x 260, 96 KB.